If you find yourself making a bowl or chalice, and you want it to be deeper, but sinking isn’t taking it far enough, then you need to start raising. That’s where the raising hammer comes in. Raising hammers are used with (usually) metal stakes to stretch the metal beyond what sinking can do. There are two kinds of raising (that I know of), angle raising and crimp raising. In angle raising you should be holding the disk/bowl/form on an angle to the stake and then using the hammer to push the metal down to the stake. I know I said “stretch” metal above, but you actually shouldn’t be pinching the metal between the hammer and stake. If you pinch it, it will over stretch the metal, leaving you with walls that are too thin. As you raise, you want to do one row counter-clockwise and the next row clockwise to keep the piece from twisting too much. In crimp raising you use a special stake and you make crimps in the form that drive the letal up and then are smoothed out when you bouge it. It doesn’t take less time, it’s just a different way of doing it. When you crimp, you usually use a non-metal hammer to avoid stretching the metal unevenly or marring it too much. I have a delron hammer that I will discuss later in this series. When raising, you also must thicken your edge between rounds, especially if you are pinching your metal. You use a sand bag (or I’ve also heard your thigh) and you hammer down on the edge of the form, upsetting it. 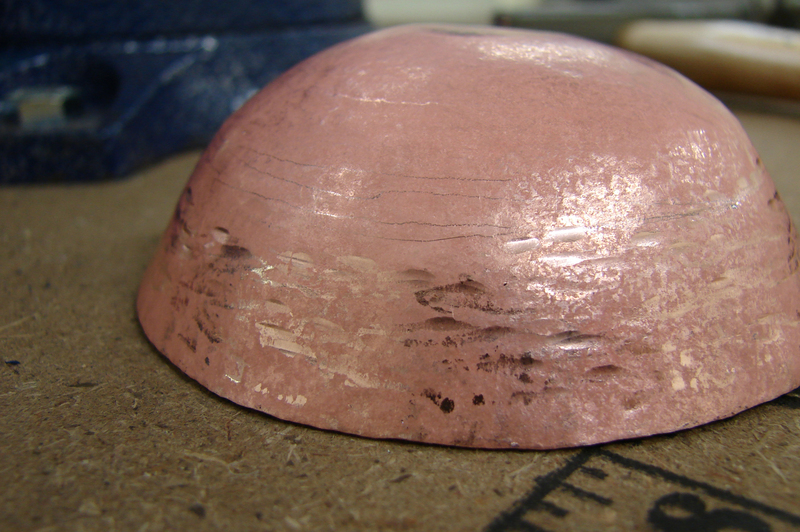 DO NOT DO THIS JUST AFTER ANNEALING! You can collapse your walls if they have just been annealed. You also don’t want to over thicken your edge, as it can crack. I usually raise, bouge, raise, bouge, thicken edge and anneal. If the piece seems to be getting harder to move, then I only do one round of raising. 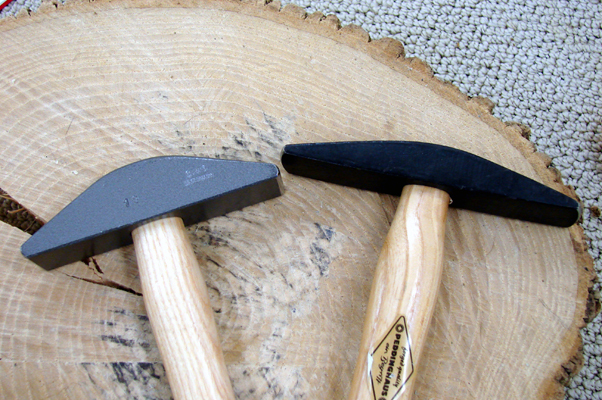 Raising hammers can also be used to forge and I often use them when I am forging wire that I want to leave the hammermarks on. You can use them for texture on sheet, but it will warp the metal a bit.